The juggernaut that is Superplastic continues with the reveal of their latest SuperJanky yesterday! 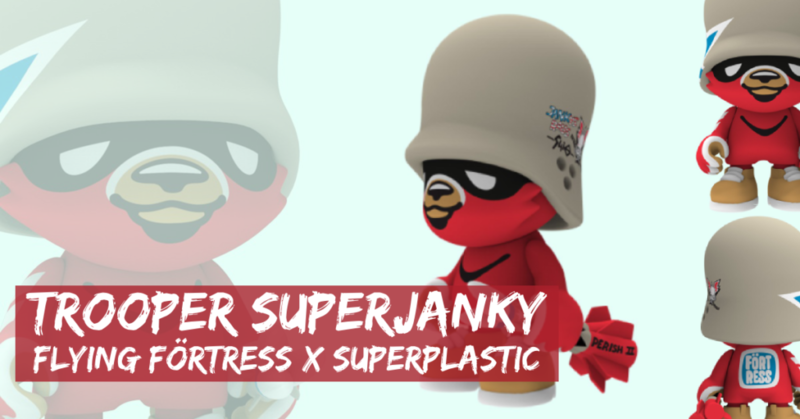 Teaming with the iconic Flying Förtress, Superplastic have just released Trooper SuperJanky for your pleasure. Sporting a giant helmet, a handful of crushed nukes and shitload of attitude, Trooper SuperJanky is based on his iconic anti-war army of Teddy Troops, seizing walls worldwide since the late 80’s. Limited to 400 pieces. Standing at 8inches tall, Trooper SuperJanky is priced at $85 (£64). Available to purchase right now from the Superplastic online store HERE.